Retaining Walls – Creative Bricks 'n Blocks Ltd. These products are SPECIAL ORDER – non-stocking items. 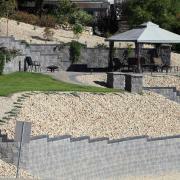 Valleystone Retaining Wall Block is a stocking item. The remaining wall block pictured is SPECIAL ORDER.